1. The modulus of the gear is reduced and the tooth width is increased. This is because the modulus increases and the deformation is small after the tooth carrying, which is beneficial to the noise reduction, but the modulus is large and the manufacturing error (such as the tooth shape error and the base error) also increases, which causes the noise to increase, so the smaller modulus should be selected as far as the tooth strength and deformation permit. The tooth width directly affects the deformation and the size of the tooth error after the gear tooth. The tooth width is inversely proportional to the bending of the teeth, the tooth width is doubled and the tooth bending is reduced by half. In this sense, the increase of the tooth width is beneficial to the reduction of the noise. 2. Improve the tooth shape of melt pump. 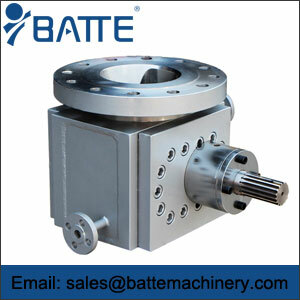 Through the improvement of tooth profile, the gear has little impact on the gears when running, and the transmission line is stable, and the periodic fluctuation and vibration are reduced, thus reducing noise. In recent years, the tooth profile of asymmetric involute arc tooth profile, which has appeared in recent years, solves the problem of flow pulsation well, improves the smoothness of transmission and reduces the noise. 3, select the bearings. Bearing not only affects the life of gear pumps, but also the structure of bearings will directly affect the noise of gear pumps. 4, improve the accuracy and surface finish of parts. The surface roughness is high, the coefficient of liver friction is large and the friction force is large. This means that for a given load, the transmission needs greater power and therefore the noise increases.